WASHINGTON (AP) — The acting Army secretary has signaled his support for legislation that would reverse a decision by his predecessor and allow female World War II pilots known as WASPs to continue placing their ashes at Arlington National Cemetery. Patrick Murphy said during congressional testimony Wednesday that Congress needs to act because he doesn't have the authority to unilaterally fix a problem that stems from a decades-old law. Despite the backing, Murphy came under fire from a Republican lawmaker who criticized his response as an overly bureaucratic solution. 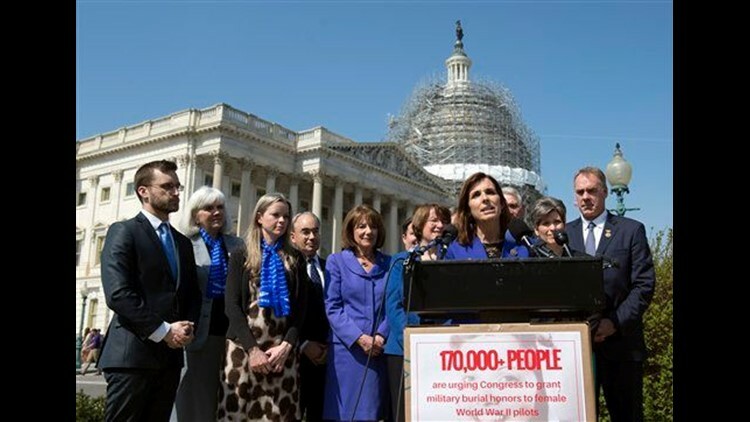 "He seems to think that no one in the executive branch has the authority to let the WASPs in as a group," Rep. Martha McSally, R-Ariz., said at a Capitol Hill news conference. "He said the fastest way to fix this is an act of Congress, which sounds sort of ironic." The WASPs served in a special unit called Women Airforce Service Pilots. They flew noncombat missions to free up male pilots for combat. During the war, the women were considered civilians. But since 1977, federal law has granted them status as veterans. Since 2002, they have been eligible to have their ashes placed at Arlington with military honors. But in March 2015, then-Secretary of the Army John McHugh ruled that WASPs never should have been allowed in and revoked their eligibility. McSally, a retired Air Force fighter pilot, introduced legislation that would change McHugh's ruling and allow the women's ashes to be inurned at Arlington. Her bill has 181 co-sponsors. "I think it's ridiculous that at a time when the Pentagon has decided to open up every single military position to women, which I support, they are closing the gates to Arlington to the pioneers who paved the way," McSally said. The family of a WASP who died after McHugh's ruling, Elaine Harmon, is pushing to have the eligibility restored. Her ashes are sitting in a closet in her daughter Terry Harmon's home. Harmon, 69, of Silver Spring, Maryland, said Wednesday she's confident McHugh's ruling will be reversed. "When the WASPs did anything they always had no doubt," she said. "There's no doubt this legislation will get passed." A petition on change.org to overturn McHugh's directive has received more than 170,000 signatures. A group of senators led by Johnny Isakson, R-Ga., and Richard Blumenthal, D-Conn., called on Murphy in February to restore WASPs' eligibility. Murphy's response on Tuesday, released by Blumenthal and Isakson, said legislation to make the WASP's eligible for inurnment is "the clearest and most expedient path." But he also urged that the bill be narrowly written because of the overall capacity limitations at Arlington.